The Clever Retort is an apothecary on the main trading plaza of Haven. 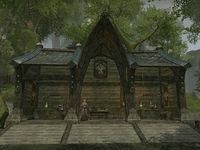 It is a large shed which has two alchemy stations. There is also a table here with books and alchemical equipment. There can be a couple of bottles on it with a solvent or a drink. From time to time Cirendur comes to the shop to make some notes or to consult the books. The apothecary services become available once Haven is liberated from pirates.